One of the things that sometimes seems to get lost when people talk about the power of the market to create efficiency is that a free market requires that information be shared and freely available and understandable by everyone. When information is withheld by one side or the other of a transaction, or when different customers for a service or product are unable to compare prices, the metaphor of the invisible hand breaks down. You can see, this, interestingly enough, in sports as it relates to both the trading of players under contract and the signing of free agents. Since I’m a baseball fan, let me link here to a discussion of research that’s been done looking at Major League Baseball. The studies looked at players traded or signed by a different team as a free agent and how those players performed in subsequent years versus players whose original team re-signed them. It turns out that players who switched teams did, indeed, perform more poorly relative to projections than players who stayed. This suggests that the original teams have proprietary information that allows them to make better decisions about which players to retain. Thus the market for baseball players isn’t quite free and efficient because of information asymmetry. And unfortunately, information asymmetry is also rampant in other industries such as healthcare. The New York Times, among others, has been devoting a lot of time and pages (for example, here, here and here) to the question of how much do hospital and other healthcare services cost, really. It seems like this should be easily available and standardized information, doesn’t it? In theory, everyone who sells something takes the cost of goods, labor, and overhead and adds what they feel is the correct amount of profit, and there you go. Bob’s your uncle. But not in healthcare. The identity of the specific hospitals are anonymous (a problem in and of itself, but something the study authors had to agree to in order to get data), but just the spread of the data points is remarkable. For Cleveland and Kansas City, for example, the spread is 2-3 fold between the highest and lowest prices charged to private insurance for outpatient services. All costs are relative to Medicare pricing, and Bill Ryan, who is both president and CEO of the hospital trade group in Northeast Ohio, is reported as describing the study as flawed because he feels the Medicare baseline is too low. But that doesn’t mitigate the problem of the spread in the data. Regardless of the baseline used, 2-3 fold higher is still 2-3 fold higher when comparing the lowest to the highest charging hospitals. And yet the specific information about which hospital charges the most and the least is unknown, and the hospitals themselves frankly have little incentive to widely publicize their costs. Because of the power of information asymmetry. If they keep their costs close to their chests, they have leverage in negotiating with each insurance provider. This is a problem for healthcare costs in general though. It doesn’t allow consumers to make a choice, even in larger markets like Cleveland where (sometimes) a decision can be made between hospitals. It’s also a problem given the trend toward hospital mergers that has been happening over the last several years (nice graphic here at the NYTimes). 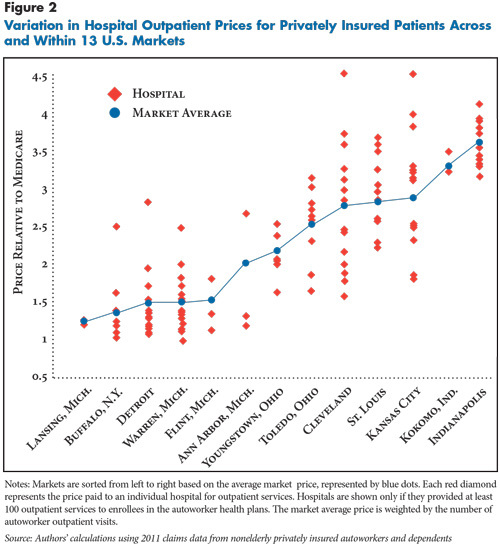 As there are fewer hospitals, any effect there is of competition to keep prices low becomes more limited. If we want to rein in healthcare costs, and if we hope the market will do it, then one key piece would be making more of the information about pricing freely and openly available. This entry was posted in Baseball, Big Data, Business, Civic Development, Knowns and Unknowns, Networks and Systems, Public Health, Randomness and tagged Cleveland, Free agents, healthcare costs, hospitals, information asymmetry, invisible hand, Major League Baseball, market efficiency, Medicare, MLB, WCPN. Bookmark the permalink.